But when it came time to start my own college search, I began most conversations with, “I’d like a small liberal arts college, not in California, academically challenging, and not Swarthmore.” I initially thought that if I went to Swarthmore my experience would somehow not be my own but would be colored by his experience. Fortunately, I reconsidered. My father and I now agree that Swarthmore is the best college either of us could have hoped for. I treasure those old yearbook photos I found in McCabe late one evening (my dad with his long hair and large glasses sitting on the lawn), our memories of walking together in the Crum Woods, and sitting together in the “Big Chair” at my graduation. However, I would not be enjoying those memories today if I had not received tuition assistance. Because my parents valued education above nearly everything else, they always assured my two siblings and me that they would “find a way to pay” for college. But having three kids within a span of seven years proved to be financially challenging. With the generous help of our schools (all small liberal arts colleges: Swarthmore, Allegheny, and Grinnell) we were able to get the education our parents had hoped to provide us. As a result, I gained immeasurably. I know that I worked harder at my studies than I ever had before (and perhaps ever will again! ), and I remember feeling invigorated by learning so many new things about the world. It was at Swarthmore that I took my first non-Western history classes, studied statistics and world dance, got through the dative case in German, and could (briefly) sight-sing the musical installation art on the wall in San Francisco International Airport. I thrived on the invigorating back and forth that one enjoys in small classes, at Paces, or at the lunch table. In many ways, I miss that in my life after college. My education has prepared me well for a career in the fast-paced high-tech arena. The constant exposure and requirement to quickly pick up new subjects, read extensively, think critically, and debate intelligently have been assets in a series of jobs. Having the ability to know the right question to ask has been critical. I also like to think that my attitude of always asking, “Are we sure this is the best approach?” or “What if we looked at the problem this way?” comes from the questions debated around the seminar table at Swarthmore. Cognizant of what I gained from my Swarthmore experience, I’m eager to give back in many ways—volunteering time as well as money. My willingness to help out landed me the role of Connections (regional alumni organization) chair for my area—quite by accident. I emailed the Alumni Relations office to ask why there wasn’t a Los Angeles Connections chair. You’d never guess who was immediately nominated! When I moved north a year later to San Francisco, the Connections chair was leaving town, so I was welcomed to take over. Making connections with my fellow Bay Area alumni has enriched my life immensely. I’ve been so impressed by their enthusiasm, passion, and generosity in sharing their work, homes, and talents. We have built a strong network far from College Avenue. No matter how you’re able to give—whether it’s helping to support student scholarships, hosting an extern, or organizing an alumni gathering—please consider pitching in. Doing so has made my life more rewarding in the years since I left Swarthmore, and I hope giving back will do the same for you. I give to Swarthmore for a very simple reason—it’s my way to honor the memory of other donors who gave before me, whose generosity allowed me to attend such a wonderful school. In my own modest but consistent way, I hope to ensure that those students who came after me have the same educational opportunities that I did. I’m pleased to support the educational institution that gave me—and my father—so much. 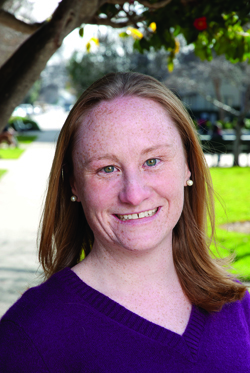 Autumn Quinn ’04 lives in the Bay Area and has worked for Google for the last five years. She enjoys the decidedly low-tech hobbies of cooking, knitting, gardening, and reading books and magazines (on paper) when she’s not at work.